As customers, we all share Bob’s view. When a company listens to me and satisfies my needs, that company is customer-centric. Consultants and academics suggest numerous definitions, but no one is more suitable, more authoritative than the beholder – the customer – to tell us what customer-centricity is all about. Fair enough, isn’t it? To the customer, customer-centricity is listening to me and satisfying my needs. Satisfying my needs echoes the “self-interest” idea proposed by Adam Smith over two hundred years ago. Self-interest drives every individual. “When you satisfy my needs, you’re customer-centric; when you don’t, you aren’t.” It is that simple and direct. Customer-centric companies can’t afford not to satisfy my needs. But “my needs” are different from yours. Different customers, like Bob, like you, like me, each of us has a different set of needs: more product features, better service, lower prices, shorter queuing time, longer opening hours, more convenient locations, the list goes on and on. When a company wants to be customer-centric in the eyes of their customers, the company has to satisfy various and different needs. Satisfying these needs consumes tremendous resources. Over the last decade, customer-centricity has been the most significant development and trend within customer management. It has become the sacred belief of many companies. This trend has continued to grow as more and more companies join the camp of customer-centricity. I predict that customer-centricity will continue to grow in popularity in the coming years until it hits a tipping point. The tipping point, in my opinion, will arrive very soon in developed countries. Customer-centricity brings companies two distinct advantages. First, if a company delivers poor or unsatisfactory experiences, such as Telco operators in developing countries, they can listen to their customers to improve unacceptable service and fix the basics. Second, if most of your rivals are not customer-centric, and you are the first company listening to your customers and satisfying their needs, you can stand out and differentiate. The marginal gain is huge. However, companies in the developed world no longer enjoy these two advantages. Today, the marginal gain for being customer-centric is small and becoming negative. There are three reasons why I say this. Number one: Satisfying the sophisticated needs of a mature customer base in developed countries takes much more effort than satisfying the basic needs of a relatively immature customer base in the developing world. This consumes a substantial amount of your limited resources. Number two: When you try to satisfy most needs of most customers, you dilute your resources and attention. You spend less and focus less on what you do well. This reduces customer happiness created by your branded pleasures. Number three: When you are just like every other company in your market trying to satisfy most needs of most customers, you make yourself more like you rivals. This homogenizes your brand. For the coming decade, the most pressing concern of the companies in the developed world, especially the United States and Western Europe, is how to survive and continue to make a profit. A stagnant economy and thin profit margins place strong pressure on resources. Knowing how to put limited resources to best use will distinguish winners from losers in the coming decade. I am not a Christian, but I know a famous story in Bible, the loaves and fish, in which a few loaves of bread and a couple of fish feed five thousand people. It is a miracle when we put the story in a religious context, but it becomes ridiculous when we consider it logically. Do you really think two fish and five loaves can feed five thousand people? Do you really think you can use the limited resources of your company to satisfy the seemingly endless needs of your customers? The issue we face now and in the foreseeable future is how to put the limited resources to best use. Customer-centricity demands more resources, reduces customer happiness and homogenizes brands. Customer-centricity is not the solution to the problem; customer-centricity IS the problem. The solution to the problem of putting limited resources to best use is simple but not easy. The solution to the problem is definitely not customer-centricity. May I suggest an alternative approach? Stage a Resource Revolution! 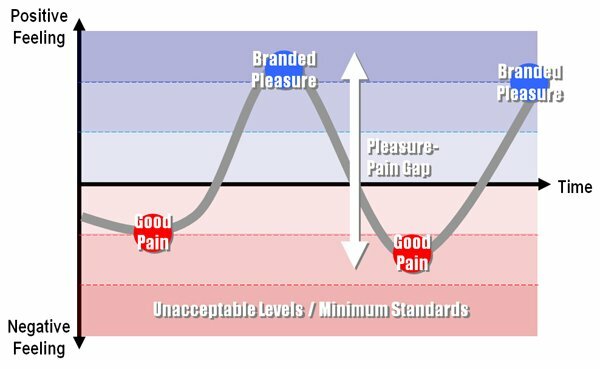 To kick off the resource revolution: 1) allow imperfections and pain to release resource constraints; 2) be yourself by identifying your own Branded Pleasures and Good Pains; and 3) unleash your full potential by maximizing the gap between Branded Pleasures and the Good Pains. Customer-centricity is wrong and will fail. Wake up! Stop deluding yourself – there’s no such thing as having it all. Allow pain, be yourself and unleash your full potential. Customer-centricity is wrong and will fail. When I was teaching my ideas in the United States, a woman exclaimed, “Sampson, you’re either insane or you’ll be very successful!” I am not sure about being very successful, but I am sure I’m not insane! The current direction of customer management – customer-centricity – is wrong and won’t last long. As I said, it consumes too many resources, reduces customer happiness and homogenizes brands. Sooner or later, as the external environment worsens, when the destructive impact of customer-centricity becomes obvious, the management of your company will stop listening to you. You need to change course and shift direction. My suggested alternative is not the only solution to the problem, but it is a better approach than customer-centricity for deciding how to put the limited resource in best use. Consultants and academics may argue that the definition of customer-centricity is not satisfying most needs of most customers; they offer hundreds of different definitions. This reminds me of the arguments over the definition of CRM. CRM may be defined as a business strategy supported by technology. 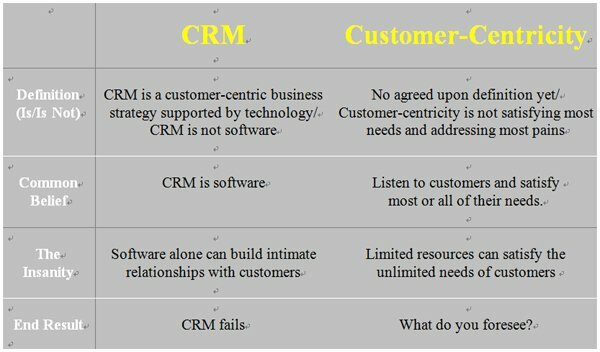 A decade ago, if you asked an average businessperson “What is CRM?” the response might be, “Do you mean Siebel?” If you ask the same question today, the answer may have changed to “Oh, you mean Salesforce.com.” CRM is software is the common belief and often the reality; CRM is a business strategy is the academic definition. Common belief – reality – always wins out over the book definition. The same applies to customer-centricity. The common belief, the reality of customer-centricity is listening to me and satisfying my needs. If your company does that, you are customer-centric; if you don’t, you aren’t. Let’s cut the hours and days spent arguing about the definition of customer-centricity. Let’s save that time for problem solving. We cannot solve the problem if we don’t face reality. The problem is simply how to put limited resources to best use. The reality is this: customer-centricity is not the solution to the problem; customer-centricity IS the problem. “Sampson is right. Just reacting to every request that customers make of your business, without consideration for the brand you want to build and the customers you wish to serve, is a recipe for disaster. Fortunately, I’ve yet to run into a business leader who takes such an extreme position,” said Bob Thompson in his blog. Bob is right. No business leader takes such as extreme position because the common belief of customer-centricity is unrealistic and unattainable for all companies. No company is able to meet this expectation. Pure customer-centricity does not make customers more satisfied with you than with your competitors and it creates waste by allocating resources ineffectively. Face the Problem. Face the Reality. Abandon customer-centricity now. Sampson Lee founded Global CEM and invented the branded customer experience management methodology (Branded CEM Method) that was first licensed in Belgium and the Netherlands. With content based on Lee’s methodology, Global CEM has run the World's 1st Customer Experience Certification workshop 61 times in 19 global cities and certified customer experience professionals from 69 countries across six continents. That extreme position, of course, is to attempt to satisfy every customer of all their needs. And yet you say that this extreme position is the common perception. I’ve been researching perceptions of customer-centricity for my upcoming book and find no common perception. What is the basis for your assertion that the common belief is an extreme position… that no business leader will take. Sorry, I’m not following your logic. In my Starbucks example, I would have been very disappointed if management had not taken action, because (in my mind at least) what they were doing was inconsistent with the experience they promised. I asked, they listened and took action. In this case satisfying me was the right thing to do, for me and their brand. But what if I had asked them to start serving hamburgers or something else that didn’t fit with their strategy? As a consumer I might have been disappointed if they said “no,” but hopefully they’d give me a good reason why not. In other words, even in declining to do what I wanted, they can do so in a customer-centric way that leaves me feeling good. Another example: a recent visit to IKEA. That’s a company you’ve written about and studied. I don’t like everything about their experience, but I accept what they sell and how they sell it. I understand their brand promise. So I’m unlikely to ask IKEA (or any other strongly branded company) to do something that doesn’t fit. In fact, research finds customers tend to ask companies to just improve what their already doing (better, faster, cheaper), not to do something completely different that is “off-brand.” It takes visionary leaders like the late Steve Jobs to envision new products that customers *didn’t* ask for, yet serve both the consumer and the brand. So, I’m confused, you say that customer-centricity is the problem, but it seems you mean that extreme form (doing everything that customers ask for) that doesn’t really exist. Why should companies be worried about doing something that they’re not doing? I’ve set out my views of customer-centricity as a journey from “focusing” on customers (think CRM/targeting) to “inspired” (serving customers’ deeper needs, not just doing what they explicitly requested) in my recent article, Let Your Customers Inspire You! Four Stages of the Customer-Centric Journey. Like Bob, I’m confused and bemused by your assertion that customer-centricity be abandoned. Abandoned…..and replaced by what operating model? Resource revolution? Every company is, and always has been, challenged to allocate scarce resources to best, most profitable, effect. Realistically, who is going to understand ideas like “Branded Pleasures” and “Good Pains”? A flexible, holistic model that focuses on optimizing customer and stakeholder value would seem a worthwhile enterprise goal. Just because there are multiple definitions of customer-centricity in the process of being refined – and, by the way, the same can be said of concepts like ’employee engagement’, for which there are more than a score of definitions after several decades of application in the marketplace – shouldn’t mean that the baby needs to be tossed out with the bathwater. Allow me to add a different perspective. For years companies have created methods and procedures, rules, policies and workarounds – mainly because they do not take time to focus on one of the recommendations Sampson is making: identifying their own Branded Pleasures and Good Pains. More often than not, only a handful of leaders at the top of the company understand this. The critical shift here is to understand the world from the outside-in. How much EFFORT do people need to expend to purchase, understand, use and receive service? Not on an individual basis, but collectively. For example, if a customer calls your company and is prompted to enter an account number, and later opts to speak to a live agent, does the agent ask the customer to repeat their account information? This is something that adds unnecessary time to every single call, which drives up the cost of service delivery. It also universally annoys everyone – the customer hates to repeat information they have already provided, and the agent gets tired of apologizing. So using technology to pass along the account number makes sense for everyone involved. That’s one way of looking at the world from the customer’s point of view, but fixing a problem that affects everyone. It also gives you a window on where to allocate resources that is effective and efficient. It is also important to consider the value of the customer base you are listening to. Not all customers are created equal; in fact, some gobble a good percentage of the resources and deliver little in return. Once you accept that you cannot be all things to all people, you are free to focus on those who want to do business with you and are profitable. Understanding the needs of a broad range of customers against the brand you want to build and the customers you want to serve is the path to sustained profitability. You do not have to be a Christian, to know this bible verse; but a few loaves of bread and a couple of fish can most likely feed five thousand people. One really does not know how large or small the fish or the loaves were, or how small the people were; or even how much of the loaves or fish did they each eat. It also depends on how large the company is whether it can satisfy the seemingly endless needs of their customers; or how small the company is to satisfy the same needs of their small customer base. “Let each company know for themselves, how much of ‘their customer’s needs’ they can satisfy; and let that company be satisfied themselves knowing that they actually did satisfy some of them” (Who gets the whole pie, or can have all of ‘a’ big apple. I’m a little confused as well. In a scenario where a company has taken the front-end effort to understand what a customer group values, designs a product and experience based on that view, continuously evaluates and improves it, and takes steps to ensure they do it profitably, that is customer-centric. It seems as though you are talking about a product-centric company who sells what they want, and listens on the back-end, trying to cater to all customers as though they were equally profitable; none of whom they really understand. If you build your business around traditional product categories, I’m about 99.99% certain you are not customer-centric. Let’s have this discussion around companies that understand the situation, or job-to-be-done, of a customer and who builds the value proposition around those which it can deliver to profitably. Reading this I found myself shaking my head over and over, and sighing. Customer-centricty feels exactly like the reality of loaves and fishes until you interview customers – and I don’t mean stilted, company-driven surveys, or group-think focus groups, but individual phone conversations with individual customers who have already bought your product or service (they’ll tell you more on the phone than in person). I’ve conducted thousands of these in-depth, human-to-human conversational interviews with my client’s customers, and in the process I learned one very comforting fact: Customers agree on almost everything, including: What’s difficult to do or understand; how you could make it easier for them to understand what you’re selling and buy from you; and what you could change about your product, service, people, processes, policies, content, marketing and selling that would make the biggest difference in the shortest amount of time. In short, they will tell you what is broken and what needs fixing. Know this, and you know how to become more customer-centric. You don’t have to do hundreds of new things; you only have to do, say five new very important things. Your customers will be delighted, and our revenue will start to go up. This is what happens to my clients. It doesn’t break the back of the company to meet these needs. On the contrary, employees are excited to see that the company’s leaders are finally rectifying things that employees have worried about for a long time. Company leaders are more sure of the direction they should be following, since they know what their customers really want from them and what they don’t care about. In my experience, until I interview the customers, everyone is guessing what is important to customers, and they are guessing wrong. This simple, but fairly unconventional approach – interview current customers to find out how to sell to future customers – is one of a couple of ways to find out that “there are only about five things that matter.” Gerry McGovern, who finds out what people really want to DO on a website, has another unconventional approach. He finds that if he presents users with a list of eighty (yes, eighty!!!) possible tasks they could perform on a particular company’s website, and asks them to pick the ones most important to them, everyone always picks the same top five. It is the investigation method that makes the difference. These methods reveal the fact that customers who come to a particular company looking for a solution have a lot in common. This is another trick – don’t focus on “what everyone else did to be successful,” but instead on what YOUR customers want from YOU. This narrows the field considerably and keeps you from chasing the latest greatest tool or method, only to have it disappoint. I actually believe in miracles, but they are not a repeatable business strategy. When it comes to pleasing customers, you don’t need a miracle, just the right way of finding out what’s really important – and then acting on what you learn. I have to admit when I saw the title of this article, I thought you may be a little off base. But in reading the rest of the article, I believe that I do understand what you are saying and I couldn’t agree more. If I’m correct, you are stating that brands should NOT try to be all things to all customers. Brands simply cannot be all things to all people and are setting themselves up for failure if they try to do so. What they should be doing is defining their brand, being certain that they know their true beliefs and values, then conduct their business catering to those customers who hold the same values and beliefs. When I work with clients, there are often times when they are compromising their values, sanity, and often times profits, when they are trying to appease all customers, especially those unreasonable ones. I teach my clients that you must set a clear definition of your culture, your values, and your ideal customer base. When you come upon folks who don’t fit into that model, you can still be viewed as a value by directing them to someone who can better serve them. Your point about no such thing as having it all is hard to accept at first, but is very true. Interesting article and view. I thought I’d also mention an article published by the Professional Journal for Customer Service and Support Management dated September/October 2005 written by Craig Bailey the President of Customer Centricity Inc.
I’m not sure I agree with all your points, but it’s great that we are getting some other voices in the wilderness asking provocative questions. In this case, starting with the concept of “customer centric” has no meaning unless we define what it means in operational and behavioral terms. Otherwise it’s just a waste of time to use these kinds of words, where we have a hundred different definitions, unstated. Just amazing to read, and it is precisely what i am doing with my customers : overdeliver on what THEY expect at the end. It is not difficult at all..
confusing people as I read the comments. Two words; Pareto Principle. Customer Centricity is about focusing on the 20% of your customer who bring 80% of your profit. Would love active dialog about this with any or all! I started to read Sampson’s article and like many was somewhat startled at the initial premise, however much of what he says is entirely correct, companies can’t respond to all the needs of all your customers all of the time profitably, especially if you try to serve ANY customer. Part of the problem with the article though is that it presumes that all companies that seek to be Customer Centric are attempting to serve any and all customers in this way. “CRM is the core business strategy that integrates internal processes and functions and external networks, to create and deliver value to targeted customers at a profit. It is grounded in high quality customer related data and enabled by information technology.” Buttle. F.
The critical words that are “targeted customers at a profit”. Boots Pharmacy in the UK very specifically segments its its customer base in order to satisfy the needs of of the customers within each by creating specific offers, services and experiences. However there is one group of customers it does not try to satisfy – Men.